A key goal of maker-centered learning is to help young people and adults feel empowered to build and shape their worlds. Acquiring this sense of maker empowerment is strongly supported by learning to notice and engage with the designed dimension of one’s physical and conceptual environment—in other words, by having a sensitivity to design. Sensitivity to design develops when young people and adults have opportunities to: look closely and reflect on the design of objects and systems, explore the complexity of design, and understand themselves as designers of their worlds. 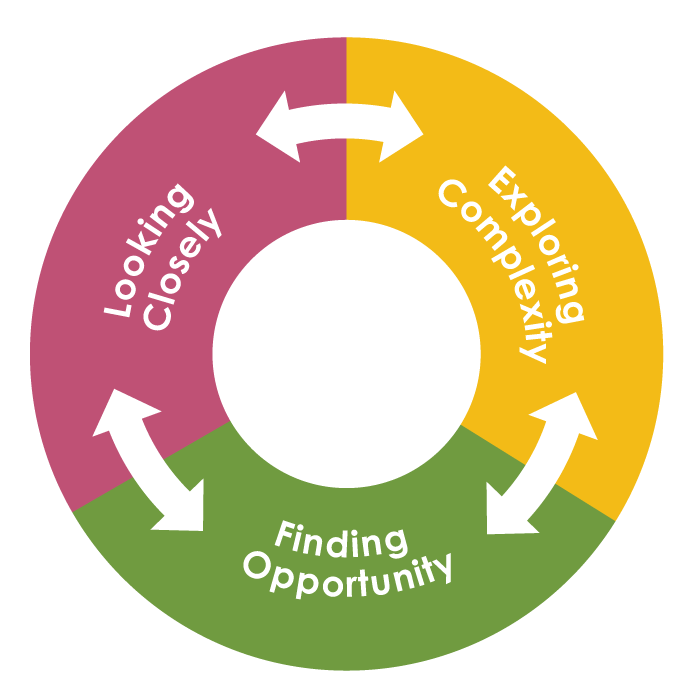 Accordingly, the Agency by Design framework describes three interrelated capacities that help learners develop a sensitivity to design: Looking Closely, Exploring Complexity, and Finding Opportunity. For each of these capacities, there is a set of observable or actionable “moves”—or indicators—that learners and educators can use to help design maker-centered learning experiences, and to support, observe, document, and assess maker-centered learning. They apply to individual as well as collaborative learning. Below are observation tools for the moves/indicators. LOOKING CLOSELY is about close, careful and sustained observation. It involves using any and all of the senses to fully notice what’s there. It often involves noticing all the parts of things and how those parts interact. It almost always means taking the time to go beyond first impressions. EXPLORING COMPLEXITY is about illustrating and exploring the multiple ways that things, ideas, and systems can be complex. It goes beyond observation to investigate how things work in the world, how they connect to larger systems, and how they can be explored and understood from different perspectives. FINDING OPPORTUNITY is about envisioning designs, redesigns, inventions, and hacks. It involves imagining how things and systems could be changed, reframed, reworked or repurposed. It often unfolds through prototyping, tinkering, and making and revising plans. Identify the maker capacity you want to observe, note the context/setting/lesson in which you are observing, and use the tool to guide your observations. Often, it’s best to focus on observing one or two Making Moves, rather than the whole capacity. After the observation experience is over, use the REFLECT section of the tool to reflect on the experience and make notes about what you’ll do going forward. Explore more tools for documenting and assessing the Making Moves. In this essay, leaders of the Agency by Design Pittsburgh network Peter Wardrip, Jeffrey Evancho, and Annie McNamarra describe their process of pursuing documentation and assessment strategies for maker-centered learning that are based on the values educators bring to their work in schools and other settings. Using the metaphor of big rocks and little rocks as introduced by Steven Covey, the authors describe the process of identifying one’s values and documenting and assessing student learning from the perspective of one’s values. They then articulate the lessons they have learned and their suggestions for moving forward. The core findings that emerge from this work are: (a) identifying one’s values is challenging, (b) documentation requires practice, (c) one’s values are linked to one’s content, and (d) visibility supports measurement. Oakland Learning Community Tatum Omari’s builds on her experience with system redesign to hack her daughter’s soccer gear.